The history of the Czech Tourist Club dates back to the year 1888, when the club was founded by a group of patriots around Vojta Náprstek. Today it has around 40 thousand members, youth creates almost one quarter of this number. The foundations of walking in the Czech Republic were laid down by the Czech Tourist Club over 100 years ago. An extensive network of hiking trails was created and marked out by hundreds of club members. This excellent net - 40 000 km - of well-marked and well-connected, Czech hiking trails is the legacy of their work. Today the hiking trails are still maintained by Czech Tourist Club members on a voluntary basis. The marking system is very easy to follow and you can find painted signs on posts, rocks and trees along the way. Sign posts at main hiking route junctions detail also kilometers to the nearest towns. In addition to walking in the beautiful historical cities, there are a great number of hiking paths and scenery-rich trails going through the Czech Republic's forests and natural areas. 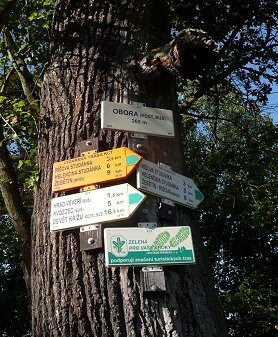 The Czech Tourist Club (Klub českých turistů) has mapped and marked these trails so that walkers can easily locate and navigate thousands of kilometres of scenic paths. In fact it is probably the best maintained system of marking in Europe. You can buy in Czech Republic maps of the paths in most bookstores, tobacco shops or museums (green maps, marked with the organization's symbol and the words EDICE TURISTICKÝCH MAP KČT 1 : 50 000 at the top). These maps are based on military maps and are very precise. It is also possible to go by bus or train to a small village at the edge of a forest and find the on-site map of the surrounding area, and four possible paths would be visible, marked in red, yellow, green and blue in nice tourist maps. Nearby such a map will be a set of directing signs, usually posted to a tree, pointing the initial direction on any of the coloured paths. The path's colour will be marked on trees throughout the path: three short horizontal bars, the outer two white and the innermost the colour of the path you are on. This symbol will at times appear as an arrow, indicating a turn. Bus and train stops will also be indicated on signs. You can also register to become a member of the Czech Tourist Club, which will enable you to camp for around 30-50 Kč per night in cottages all around the Czech Republic. In addition to this, the Czech Tourist Club publishes series of maps of the Czech hiking trails. These maps (1 : 50 000) are based on military maps and are detailed with topographical contours. Unlike other countries, Czech hiking is made easier by the fact that walkers and hikers have the right of access. Stretch your legs and take a hike. The Czech Republic has a variety of hiking "styles" be it flat, mountainous, or in the forests. An extremely well-marked trail system makes it easy to shed your weekly city life and get out for a nice relaxed or strenuous walk or hike in the fresh air of the Czech countryside. The Czech Tourist Club (Klub českých turistů, KČT) is maintaining and marking all hiking trails. Formed in 1888, the club really began going trail-marking after the World War II. Today more than 40,000 kilometers of marked routes maintained by 1,350 volunteers are available. The club also coordinates the bike and skiing trails across the country. The club is divided into 14 different branches, corresponding to the different Czech regions. Contact information to each of the groups can be found at the website. If you have been out walking around the country already, you have probably already seen the three striped markers on trees, signposts, and other handy marking spots. Two white bars sandwich an either red, blue, yellow or green stripe to indicate what path you are on and where you are going. Periodically on your walk you will come across a posting with information on how many kilometers there are still to selected cities on your chosen route. You will also see other variations on this colored sign; for example an arrow indicates the direction you should go. 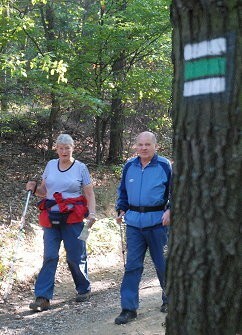 Loop paths and educational trails are specially marked; a symbol key can be found at the Czech Tourist Club's website. The Club also produces very useful hiking and cycling maps, available in just about any bookstore. The green ones are designed more for hikers; the yellow for the bikers. If you have a region you would like to explore, it is worth it to pick up one of these maps before the trip. Not only can you plan a rough route, they also offer points of interest along the way - and a very helpful beer mug indicating where you can stop for the all-important hiking places. With the largest density of castles and chateaux per square kilometer in Europe and incredible, unspoilt mountains, forests, rivers and wetland landscapes, there is so much to see and enjoy. The Czech Republic is also a walker's paradise not only for its beautiful mountains, rivers and forests but for the amount of castles and chateaux connected by the trails. There are so many different landscapes and paths that you can explore a different part of the country every time you want to go out. Czech Tourist Club has a wealth of information about the trails, including maps and selected itineraries. Since the paths were specially designed, they bring you to many interesting points including castles, quaint villages, and UNESCO sites and along rivers and other picturesque scenery. Two examples of trails being suggested include a walk starting at Hluboká, going through České Budějovice and ending in Český Krumlov. In addition to the fairy princess Hluboká chateau, you can walk along the Vltava in the foothills of the mountains Šumava. The landscape varies between forests and fields. Or head further east into Moravia and follow the trails around the wine making town of Znojmo. You could also enjoy a wonderful walk through the towns and castles of Vranov nad Dyjí, Znojmo and Bítov. There is an opportunity to hike on every corner of the country. For a more hilly and forested experience, head towards Pardubice and the river Svitava. There is an 8 kilometer trail of mostly field and forest paths beginning in Březová nad Svitavou. You can find in this region the Králický Sněžník education trail. It starts from the city of Dolní Morava and follows the yellow path. You will begin in the Morava River Valley and after 9 kilometers you find your self at the top of Králický Sněžník. You can keep going along the red trail for another 5 kilometers, ending at lodge named Návrší. 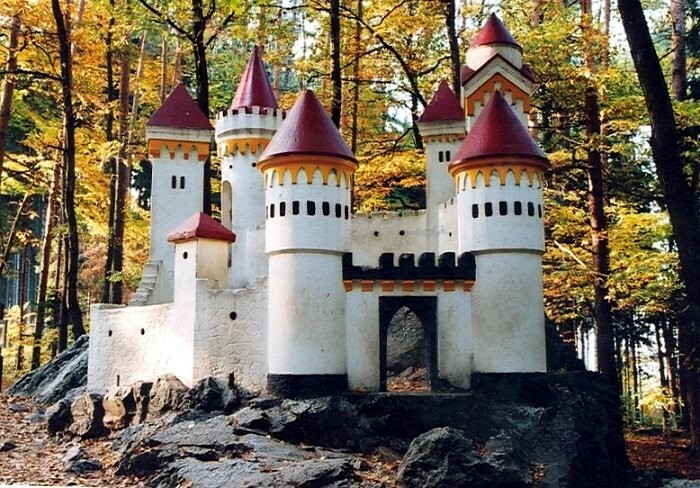 From the town of Slatiňany, you can take an easy 2 kilometers walk to "castle" Kočičí Hrádek. In more or less the same area, near the mountains Orlické hory you can pay an educational visit to the Museum of Hiking, Winter sports and Crafts (Muzeum turistiky, zimních sportů a řemesel) in Deštné v Orlických horách. Here you can learn a lot about glass making in the Orlické hory; domestic textile production; hiking and winter sports in the region, and visit a rare exhibition of washers and irons. Forest lovers should head south of Prague to the town of Písek. Lots of trees east of the city amongst the 60 kilometers of paths. A nature trail, the Jarník lookout tower a top Kraví hory and the Živec chalet are a few sites you should see. On the Austrian border, from the town of Šatov you can take a fascinating walk to some former military fortifications. Three former infantry log cabins can be found along the trail, as well as other former Czechoslovakian military outposts. 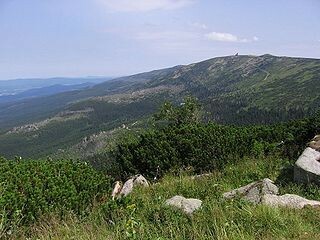 Heading north to the Polish border and the mountains Jizerské hory will reward real rock climbers, and people who like to observe rock formations. Jizerskohorské bučiny is a national nature preserve offering a forested walk on the steep slopes. This is a very brief introduction to some of the hiking areas across the country. Mountain enthusiasts should not skip the Krkonoše. Český Ráj is another not to miss location with its beautiful forested paths and amazing rock formations. The best rock labyrinths could be found the rocks in locality Teplice-Adršpach of East Bohemia. South Bohemia and its fish ponds are for lovers of flat walking, while South Moravia offers the more rugged rolling hills of wine country.